Oberlin College is a private liberal arts college in Oberlin, Ohio. Founded as the Oberlin Collegiate Institute in 1833 by John Jay Shipherd and Philo Stewart, it is the oldest coeducational liberal arts college in the United States and the second oldest continuously operating coeducational institute of higher learning in the world. The Oberlin Conservatory of Music is the oldest continuously operating conservatory in the United States. In 1835 Oberlin became one of the first colleges in the United States to admit African Americans, and in 1837 the first to admit women (other than Franklin College's brief experiment in the 1780's). The College of Arts & Sciences offers more than 50 majors, minors, and concentrations. Oberlin is a member of the Great Lakes Colleges Association and the Five Colleges of Ohio consortium. Since its founding, Oberlin has graduated 16 Rhodes Scholars, 20 Truman Scholars, 3 Nobel laureates, and 7 MacArthur fellows. Both the college and the town of Oberlin were founded in northern Ohio in 1833 by a pair of Presbyterian ministers, John Jay Shipherd and Philo Stewart. The College was built on 500 acres (2.0 km2) of land specifically donated by the previous owners, Titus Street, founder of Streetsboro, Ohio, and Samuel Hughes, who lived in Connecticut. 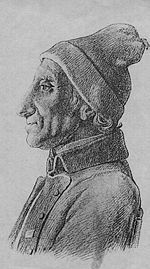 Shipherd and Stewert named their project after Jean-Frédéric Oberlin, an Alsatian minister whom they both admired. The ministers' vision was for both a religious community and school. Oberlin's founders bragged that "Oberlin is peculiar in that which is good," and the college has long been associated with progressive causes. Asa Mahan (1799–1889) accepted the position as first President of the Oberlin Collegiate Institute in 1835, simultaneously serving as the chair of intellectual and moral philosophy and a professor of theology. Mahan's liberal views towards abolitionism and anti-slavery greatly influenced the philosophy of the newly founded college; likewise, only two years after its founding, the school began admitting students of all races, becoming the first college in the United States to do so. The college had some difficult beginnings, and Rev. John Keep and William Dawes were sent to England to raise funds for the college in 1839–40. 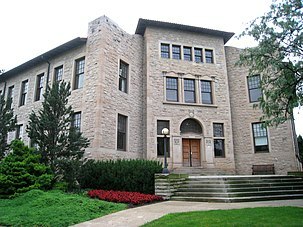 A nondenominational seminary, Oberlin's Graduate School of Theology (first called the Theological Department), was established alongside the college in 1833. 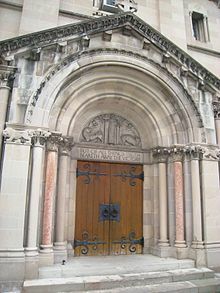 In 1965, the board of trustees voted to discontinue graduate instruction in theology at Oberlin, and in September 1966, six faculty members and 22 students merged with the Divinity School of Vanderbilt University. Oberlin's role as an educator of African-American students prior to the Civil War and thereafter is historically significant. In 1844, Oberlin College graduated its first black student, George Boyer Vashon, who became one of the founding professors at Howard University and the first black lawyer admitted to the Bar in New York State. The African Americans of Oberlin and those attending Oberlin College "have experienced intense challenges and immense accomplishments since their joint founding in 1833. Its African American and other students of color have used education and activism to influence the college, the town, and beyond. Their efforts have helped Oberlin remain committed to its values of freedom, social justice, and service." The College's approach to African Americans was by no means perfect. Although intensely anti-slavery, including admitting black students immediately from its founding, the school began segregating its black students by the 1880s with the fading of evangelical idealism. Nonetheless, Oberlin graduates accounted for a significant percentage of African-American college graduates by the end of the 19th century. The college was listed as a National Historic Landmark on December 21, 1965, for its significance in admitting African Americans and women. Oberlin is also the oldest coeducational institution in the United States, having admitted four women in 1837. These four women, who were the first to enter as full students, were Mary Kellogg (Fairchild), Mary Caroline Rudd, Mary Hosford, and Elizabeth Prall. All but Kellogg graduated. Mary Jane Patterson graduated in 1862 as the first black woman to earn a B.A. degree. Soon women were fully integrated into the college, and comprised from a third to half of the student body. The religious founders, especially evangelical theologian Charles Grandison Finney, saw women as inherently morally superior to men. Oberlin briefly stopped operating for seven months 1839 and 1840 due to lack of funds, making it the second oldest continuously operating coeducational liberal arts. Mahan, who had often been in conflict with faculty, resigned his position as president in 1850. In his place, famed abolitionist and preacher Charles Grandison Finney (already a professor at the college since its founding) was made president, serving until 1866. Under Finney's leadership, Oberlin's faculty and students increased their activity in the abolitionist movement. They participated together with people of the town in biracial efforts to help fugitive slaves on the Underground Railroad (where Oberlin was a key stop), as well as to resist the Fugitive Slave Act. One historian called Oberlin "the town that started the Civil War" due to its reputation as a hotbed of abolitionism. In 1858, both students and faculty were involved in the controversial Oberlin-Wellington Rescue of a fugitive slave, which received national press coverage. Two participants in this raid, Lewis Sheridan Leary and John Anthony Copeland, along with another Oberlin resident, Shields Green, also participated in John Brown's Raid on Harpers Ferry. This heritage was commemorated on campus by the 1977 installation of sculptor Cameron Armstrong's "Underground Railroad Monument" (a railroad track rising from the ground toward the sky) and monuments to the Oberlin-Wellington Rescue and the Harper's Ferry Raid. Oberlin College was also prominent in sending Christian missionaries abroad. In 1881, students at Oberlin formed the Oberlin Band to journey as a group to remote Shanxi province in China. :24-23 A total of 30 members of the Oberlin Band worked in Shanxi as missionaries over the next two decades. Ten died of disease, and in 1900, fifteen of the Oberlin missionaries, including wives and children, were killed by Boxers or Chinese government soldiers during the Boxer Rebellion. The Oberlin Shansi Memorial Association, an independent foundation, was formed in their memory. The Association, with offices on campus, sponsors Oberlin graduates to teach in China, India, and Japan. It also hosts scholars and artists from Asia to spend time on the Oberlin campus. Peters Hall, home of the language departments, in 2010. Henry Churchill King (1858–1934) became Oberlin's sixth president in 1902. At Oberlin from 1884 onward, he taught in mathematics, philosophy, and theology. Robert K. Carr served as Oberlin College president from 1960–1970, during a tumultuous period of student activism. Under his presidency, he increased the school's physical plant, with 15 new buildings completed. Under his leadership, student involvement in college affairs increased, with students serving on nearly all college committees as voting members (including the Board of Trustees). Despite these accomplishments, Carr clashed repeatedly with the students regarding issues related to the Vietnam War, and he left office in 1969 (with History professor Ellsworth C. Clayton taking over as acting President), and was forced to resign as President in 1970. Oberlin (and Princeton) alumnus Robert W. Fuller's commitment to educational reform—which he had already demonstrated as a Trinity College dean—led his alma mater to make him its tenth president in November 1970. At 33 years old, Fuller became one of the youngest college presidents in U.S. history. During his Oberlin presidency—a turbulent time at Oberlin and in higher education generally—Fuller reshaped the student body by tripling the enrollment of minorities at the college. He also recruited and hired the first four African-American athletic coaches in a predominantly white American college or university, including Tommie Smith, the Gold Medalist sprinter from the 1968 Summer Olympics in Mexico City. In 1970, Oberlin made the cover of Life as one of the first colleges in the country to have co-ed dormitories. Fuller was eventually succeeded by the longtime Dean of the Conservatory Emil Danenberg, who served as President from 1975–1982, when he died in office. In 1983, following a nationwide search, Oberlin hired S. Frederick Starr, an expert on Russian and Eurasian affairs, as well as a noted musician, as its 12th president. Starr's academic and musical accomplishments boded well for his stewardship of both the College and the Oberlin College Conservatory of Music. However, despite increasing minority hiring, Starr's tenure was marked by clashes with students over such issues as divestment from South Africa and the dismissal of a campus minister, as well as Starr's general approach of reframing Oberlin as the "Harvard of the Midwest." After a particularly vitriolic clash with students that took place on the front lawn of his home in April 1990, Starr took a leave of absence as president from July 1991 – February 1992. He officially resigned in March 1993, effective to June of that year. Nancy Dye became the 13th president of Oberlin College in July 1994, succeeding the embattled Starr. Oberlin's first female president, she oversaw the construction of new buildings, the increased selectiveness of the student body, and helped increase the endowment with the then-largest capital campaign in the college's history. As president, Dye was known for her accessibility and inclusiveness. Especially in her first few years, she was a regular attendee at student events such as football games, concerts, and dorm parties. Dye served as President for nearly 13 years, resigning on June 30, 2007. Marvin Krislov served as president of the College from 2007 to 2017, moving on to assume the presidency of Pace University. On May 30, 2017, Carmen Twillie Ambar was announced as the 15th president of Oberlin College, in the process becoming the first African-American person and second woman to hold the position. Oberlin's first and only hired trade union expert, Chris Howell, argues that the college engaged in "illegal" tactics to attempt to decertify its service workers' July 1999 vote to become members of United Automobile Workers union. Howell argues that college workers sought the union to represent them in response to the administration's effort to "speed up work" to meet a "mounting budget crisis". In February 2013, the college received a significant amount of press focusing on the so-called "No Trespass List," a secret list maintained by the college that bars individuals from campus without due process. Student activists and members of the surrounding town joined together to form the One Town Campaign, which sought to challenge this policy. On February 13, 2013, a forum at the Oberlin Public Library with over 200 people in attendance, including members of the college administration, the Oberlin city council and national press, saw speakers compare the atmosphere of the college to "a gated community." In September 2014, on Rosh Hashanah, Oberlin Students for Free Palestine placed 2,133 black flags in the main square of the Campus as a "call to action" in honor of Palestinians who died in the 2014 Israel–Gaza conflict. In January 2016, hundreds of Oberlin alumni signed a letter to the Oberlin administration stating that this protest was one example of anti-Semitism on the campus. In 2015, students organized to protest the campus dining department and food contractor for alleged instances of cultural appropriation and cultural insensitivity. In early 2016, an Oberlin professor, Joy Karega, blamed Israel for the Charlie Hebdo attacks and for ISIS, prompting a rebuke from faculty and administration. After five and a half months of discussion, the school suspended and then fired her. The following week, the home of a Jewish professor at Oberlin was vandalized and a note that read "Gas Jews Die" was left on his front door. Oberlin was ranked the 30th best national liberal arts college in the 2019 edition of U.S. News & World Report Best Colleges Ranking. Of Oberlin's nearly 3,000 students, nearly 2,400 are enrolled in the College of Arts & Sciences, a little over 400 in the Conservatory of Music, and the remaining 180 or so in both College and Conservatory under the five-year Double-Degree program. The College of Arts & Sciences offers over 50 majors, minors, and concentrations. Based on students graduating with a given major, its most popular majors over the last ten years have been (in order) English, Biology, History, Politics, and Environmental Studies. The College's science programs are considered strong, especially Biology, Chemistry and Physics. The college is home to the world's first undergraduate Neuroscience program. 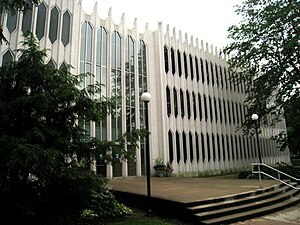 The Oberlin Conservatory of Music is located on the college campus. Conservatory admission is selective, with over 1400 applicants worldwide auditioning for 120 seats. There are 500 performances yearly, most free of charge, with concerts and recitals almost daily. The Conservatory was one of the recipients of the 2009 National Medal of Arts. The Allen Memorial Art Museum, with over 13,000 holdings, was the first college art museum west of the Alleghenies. Panoramic view Oberlin's North Quad, the heart of North Campus and home of the Barrows, Burton, East, Noah and Barnard Houses. 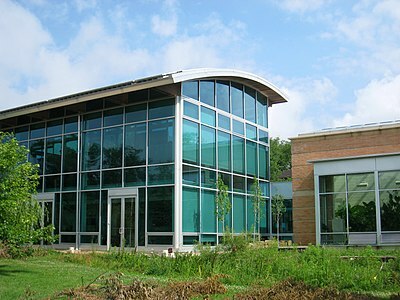 The Oberlin College Libraries has branches for art, music, and science, a central storage facility, and the Mary Church Terrell Main Library. The libraries have collections of print and media materials and provide access to various online databases and journals. Beyond the 2.4 million-plus items available on campus, Oberlin students have access to more than 46 million volumes from over 85 Ohio institutions through the OhioLINK consortium. In the summer of 2007 the main level of the main library was converted into an Academic Commons that provides integrated learning support and is a hub of both academic and social activity. The college's "Experimental College" or ExCo program, a student-run department, allows any student or interested person to teach their own class for a limited amount of college credit. ExCo classes by definition focus on material not covered by existing departments or faculty. Another aspect of Oberlin's academics is the winter term during January. This term was created to allow students to do something outside the regular course offerings of the college. Students may work alone or in groups, either on or off campus, and may design their own project or pick from a list of projects and internships set up by the college each year. Students must complete a winter term project three years out of their four in the College of Arts and Sciences. Projects range from serious academic research with co-authorship in scientific journals, to humanitarian projects, to making avant-garde films about historic Chicago neighborhoods, to learning how to bartend. A full-credit project is suggested to involve five to six hours per weekday. Created in 2005 as a part of the Northeast Ohio Collegiate Entrepreneurship Program (NEOCEP), a Kauffman Campuses Initiative, and sponsored by the Burton D. Morgan and Ewing Marion Kauffman, the department is focused on supporting and highlighting entrepreneurship within the student body. This is done through a series of classes, symposia, Winter Term programs, grants, and fellowships available at no cost to current students and in some cases, recent alumni. One such opportunity is the Creativity and Leadership Fellowship, a one-year fellowship for graduating seniors that includes a stipend of up to $30,000 dollars to advance an entrepreneurial venture. In 2012, the Creativity and Leadership department announced LaunchU, a business accelerator open to Oberlin College students and alumni who are pursuing an entrepreneurial venture. The selective, three-week intensive program connects the participants with other entrepreneurs and business leaders chosen from the surrounding northeast Ohio region as well as the extensive Oberlin College alumni network. LaunchU culminates in a public pitch competition before a guest panel of investors, where the participants have the opportunity to be awarded up to $15,000 in funding. The winner of the 2014 LaunchU pitch competition was Chai Energy, a Los Angeles-based green energy startup focused on modernizing and personalizing home energy monitoring. In 2014, LaunchU announced the creation of an online network in order to build stronger connections between entrepreneurs within the Oberlin College students and alumni network with a focus on attracting younger alumni. The Oberlin student body has a long history of activism and a reputation for being notably liberal. The college was ranked among the Princeton Review's' list of "Colleges with a Conscience" in 2005. In the 1960s, Memorial Arch became a rallying point for the College's civil rights activists and its anti-war movement. Oberlin supplied a disproportionate number of participants in Mississippi Freedom Summer, rebuilt the Antioch Missionary Baptist Church in the Carpenters for Christmas project, supported NAACP sponsored sit-ins in Cleveland to integrate the building-trades, and with the SCLC participated in demonstrations at Hammermill Paper. Emeritus Professor of Sociology (1966–2007), James Leo Walsh stated that students, "...carried out dozens of protests against the Vietnam war ranging from peaceful picketing to surrounding a local naval recruiters car", to the Oberlin Review in 1995. In November 2002, 100 college workers students and faculty held a "mock funeral 'for the spirit of Oberlin'" in response to the administration's laying off 11 workers and reducing the work hours of five other workers without negotiation with college unions. 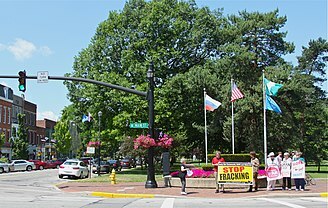 Oberlin Students have protested instances of fracking in Ohio such as "the first natural gas and fracturing industry conference in the state" in 2011. At College and Main St., Oberlin OH. Subjects of protest include the War in Afghanistan, and oil well fracking. In 2004, student activism led to a campus-wide ban on sales of Coca-Cola products. However, this was revoked in spring 2014 and students may now buy Coca-Cola products from the student union. In 2013, after the discovery of hateful messages and the alleged sighting of a person wearing KKK robes, president Marvin Krislov cancelled classes and called for a day of reflection and change. In a public statement, he stated that an investigation had identified two students believed to be largely responsible, who had been removed from campus. One of the students responsible said to police that he was "doing it as a joke to see the college overreact to it". During the fall 2014 semester, Oberlin's Student Labor Action Coalition organized a petition to permit dining hall temporary workers working four-hour shifts to eat one meal from food the college throws out each day. The petition garnered over 1,000 signatures and resulted in workers obtaining the opportunity to put food into a management-given styrofoam container to eat after their shifts. In May 2015, students temporarily took over their school's administration building to protest a $2,300 increase in tuition cost between the 2015 and 2016 academic school years. Students initially proposed, "...moving from providing merit aid to need-based scholarships, loosening on-campus dining and housing requirements, reducing food waste and temporary workers in Campus Dining Services... " to the school's Vice President of Finance Mike Frandsen on Monday, April 27, 2015, in which their demands were declined for issue. $10,931,088 were allocated to management salaries for the 2013–2014 school year, much of which came from student tuition. In December 2015, Oberlin's Black Student Union issued a series of 50 specific demands of the college and conservatory including promoting certain black faculty to tenured positions, hiring more black faculty, firing other faculty members, and obtaining a $15 an hour minimum wage for all campus workers and guaranteed health care in their contracts. The board of trustees responded by appointing some of the individual faculty and by, "reviewing the allocation of faculty positions with consideration of how they will contribute to interactional diversity in the curriculum" in the college's 2016–2021 strategic plan. The college opposed firing any employees in response and neglected to issue formal responses to many of the other demands though has sought to cut wages and health care funds for administrator, office worker and library support staff Office and Professional Employees International Union members during contract negotiations. Many campus workers still earn the minimum wage. Over 75 students protested the college's attempt to alter administrator, office worker and library support staff contracts during spring 2016 contract negotiations. Oberlin is also known for its liberal attitude toward sexuality and gender expression. Oberlin has been consistently ranked among the friendliest college campuses for LGBT students by multiple publications, including The Advocate, Newsweek, and The Princeton Review. Keep Cottage, one of the four housing co-ops. The Oberlin Student Cooperative Association, or OSCA, is a non-profit corporation that houses 174 students in four housing co-ops and feeds 594 students in eight dining co-ops. Its budget is more than $2 million, making it the third-largest of its kind in North America behind the Berkeley Student Cooperative and the Inter-Cooperative Council of Ann Arbor, and by far the largest relative to the size of the institution whose students it serves. OSCA is entirely student-run, with all participating students working as cooks, buyers, administrators, and coordinators. Every member is required to do at least one hour per week of cleaning if they are able, encouraging accountability for the community and the space. Most decisions within OSCA are made by modified consensus. 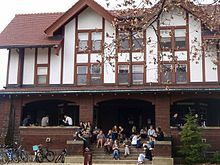 Oberlin bans all fraternities and sororities, making the co-ops the largest student-organized social system at the college. In addition to OSCA's four housing/dining and three dining-only cooperatives, Brown Bag Co-op is an OSCA-backed grocery that sells personal servings of food at bulk prices. OSCA also funds the Nicaragua Sister Partnership (NICSIS), a "sister cooperative" with Nicaragua's National Union of Farmers and Ranchers (UNAG). NICSIS works as a micro-lending program with a mission to empower female members of the community and provide superior benefits for laborers. Outside of OSCA, other Oberlin co-ops include the Bike Co-op, Pottery Co-op, and SWAP: The Oberlin Book Co-op. In the Spring of 2013, the Board of Directors of OSCA made a decision in a closed-door meeting to remove the Kosher-Halal Co-op from the Association after disputes over budgets and kitchen inspections. Although KHC served both Kosher and Halal food, the membership was predominantly Jewish, and some alumni wrote that they believed the expulsion to be anti-Semitic in nature. In addition to Oberlin Conservatory, Oberlin has musical opportunities available for amateur musicians and students in the college. Oberlin Steel, a steel pan ensemble founded around 1980, plays calypso/soca music from Trinidad and Tobago and has been performing at Oberlin's Commencement Illumination event for over 30 years. Oberlin College Taiko, founded in 2008, explores and shares Japanese taiko drumming as both a traditional and contemporary art form. The entirely student-run Oberlin College Marching Band (OCMB), founded in 1998, performs at various sporting events including football games, women's rugby, and pep rallies throughout the year. There are a number of a cappella groups, including the Obertones (all-male), Nothing But Treble (all-female), the Acapelicans (all-female), 'Round Midnight (co-ed, jazz/folk), Pitch, Please (co-ed), and Challah Cappella (co-ed, Jewish). Other notable music organizations include the Black Musicians Guild and the Arts and Sciences Orchestra. Students in the college can form chamber groups and receive coaching through the Conservatory. Student composers also provide a demand for musicians to perform their work. 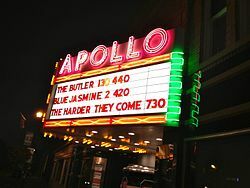 The Apollo Theater's iconic marquee at night. 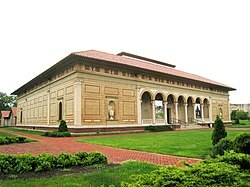 The Allen Museum, home of Oberlin's Art Rental program. Thomas Edison's moving picture show was shown in Oberlin in February 1900. Just seven years later, Oberlin's Apollo Theater opened, installing sound equipment for the 1928 release of The Jazz Singer, the first "talkie." The theater has since been a mainstay in the Oberlin community at its comfortable locale on south campus, and in 2012 (after a year of renovations) became the centerpiece for The Danny DeVito and Rhea Perlman Cinema Studies Center for Media Education and Production. The area above the theatre includes editing labs, an animation area, a recording studio and small projection screening room. Oberlin's museum has a unique art rental program. At the beginning of every semester students camp out in front of the north gate of the college's Allen Memorial Art Museum to get first pick of original etchings, lithographs and paintings by artists including Renoir, Warhol, Dalí, and Picasso. For five dollars per semester, students can hang these works on their dorm room walls. The program was started in the 1940s by Ellen H. Johnson, a professor of art at Oberlin, in order to "develop the aesthetic sensibilities of students and encourage ordered thinking and discrimination in other areas of their lives." In 2006, Oberlin became one of the charter institutions to sign the ACUPCC and set a target climate neutrality date for 2025. Oberlin's innovative Adam Joseph Lewis Center For Environmental Studies, a building the Department of Energy labeled as one of the "milestone" buildings of the 20th century, incorporates a 4,600 square foot (425 square meter) photovoltaic array, the biggest of its kind in Ohio at the time. The AJLC also features a Living Machine, garden, orchard, and parking lot solar array. The school utilizes biodiesel, hybrid, and electric vehicles for various purposes, offers financial support to a local transit company providing public transportation to the school, and has been home to the Oberlin Bike Co-op, a cooperatively run bicycle center, since 1986. Each residence hall monitors and displays real time and historic electricity and water use. Some dorms also have special lamps which display a color depending on how real time energy use compares to the average historic energy use. The school's Campus Committee on Shareholder Responsibility provides students, faculty, and staff with the opportunity to make suggestions and decisions on proxy votes. A student board, the Oberlin College Green EDGE Fund, manages a set of accounts to support local sustainability, resource efficiency, and carbon offsetting projects. The Green EDGE Fund, created in 2007, allocates grants for environmental sustainability projects and verifiable carbon offsetting projects within the Oberlin community, as well as loans from a revolving fund for projects at Oberlin College that reduce resource consumption and have calculable financial savings for the college. In 2007, Oberlin received a grade of "B+" from the Sustainable Endowments Institute's annual College Sustainability Report Card, and was featured among schools as a "Campus Sustainability Leader". In 2008, Oberlin received an "A-" on the annual College Sustainability Report Card. It was also listed as the school with the greenest conscience by Plenty in their green campuses ratings. In 2011, the College received an A on the Sustainability Report card. Oberlin College participated in AASHE's Sustainability Tracking, Assessment, and Rating System (STARS) in early 2012. Oberlin College was one of only 43 institutions to receive a grade of Gold in STARS. According to a 2010 article in The Oberlin Review, renovated dorms may use more electricity. This is the case for several dorms renovated during the summer of 2008. The College architect, Steve Varelmann, has called the numbers "erratic and possibly unreliable." According to Varelmann, a possible explanation for this phenomenon is that previously non-functioning equipment started functioning again after the renovation. Students may also be at fault for their behavior: "What electronic devices are they using? Are they voluntarily reducing light usage? Are spaces experiencing increased use due to the improvements achieved from the renovation?" John Scofield, professor of physics at Oberlin concluded that "We are building more and more efficient buildings, yet we're using more energy." Oberlin students publish a wide variety of periodicals. The college's largest publications are The Oberlin Review and The Grape. The Oberlin Review is a traditional weekly newspaper, focusing on current events, with a circulation of around 2,500. The Grape is Oberlin's student-run alternative newspaper. Fearless and Loathing is Oberlin's only online alternative publication, publishing news, opinions, creative non-fiction, and multimedia. There is also a newspaper pertaining to the interests of students of color, called In Solidarity. Magazines on campus include Wilder Voice, a magazine for creative nonfiction and long-form journalism, The Plum Creek Review, a literary review containing student-written fiction, poetry, translations, and visual art, Headwaters Magazine, an environmental magazine, and The Synapse, a science magazine. Spiral is a magazine focused on genre fiction. The College also produces a quarterly alumni magazine, while the Conservatory publishes its own magazine once a year. The WOBC News Corps, a news division of WOBC-FM created in February 2010, produces local news segments that air bi-hourly. WOBC, a large student organization with significant non-student membership, also maintains an online blog that focuses on music and local events. The school's varsity sports teams are the Yeomen and Yeowomen. The name Yeomen arose in the early 1900s (decade) as a result of blending the former team moniker with the school's official motto. Early on in the program, football players and other athletes were known simply as Oberlin Men or "O" Men. Eventually, as the athletic department became more cohesive, the Yeomen mascot was adopted, drawing on the phonetic sound of "O" Men and the schools official motto of "Learning and Labor". As women's sports became more prevalent, "Yeowomen" was adopted to describe the mascot representing women's athletics. In 2014, the school announced that the albino squirrel will be its official mascot, although teams will continue to be referred to as "yeomen" and "yeowomen". Oberlin participates in the NCAA's Division III and the North Coast Athletic Conference (NCAC), a conference which includes Kenyon College, Denison University, Wooster College, Depauw University and others. Kenyon has traditionally been Oberlin's biggest rival. Recently, leaders of the Athletic Department and various club sports have spoken out in favor of increased institutional support for the teams, requesting that the College provide access to professional sports trainers and team transportation. The college also hosts several private sports teams, including the Oberlin Ultimate team. On Friday, May 8, 2015, the Oberlin baseball team won the championship of the NCAC. The championship was the first for Oberlin as a baseball team since it joined the NCAC in 1984. Oberlin's football team was the first team coached by John Heisman, who led the team to a 7–0 record in 1892. Oberlin is the last college in Ohio to beat Ohio State (winning 7–6 in 1921). Though in modern times, the football team was more famous for losing streaks of 40 games (1992–1996) and 44 games (1997–2001), the Yeomen have enjoyed limited success in recent years. In 2011, Oberlin began its most recent attempt to feature a cheerleading squad. In 2006, a cheerleader fell from atop a pyramid at a football game, initiating the demise of Oberlin's Cheerleading Club. That injury prompted the school to restrict the club's activities, prohibiting stunting and tumbling, after which participation fizzled out. The club's charter, however, remained intact and was used to bring the squad back in 2011. Tryouts were held in the spring of 2011 and the cheerleading team went active at Oberlin's first home football game that Fall, a 42–0 win over Kenyon College. The squad also cheers for the basketball team and participates in spirit building and service events across campus and in the community. Oberlin has both men's and a women's Ultimate club teams, known as the Flying Horsecows and the Preying Manti respectively. The Horsecows have made trips to College Nationals in 1992, 1995, 1997, 1999, 2010, and 2018. The Manti qualified for Nationals for the first time in 1997 and have been recently in 2010, 2013, 2016, and 2018. Both teams qualified for Division III nationals in 2010 and 2018..
Mount Oberlin (Glacier National Park) — was named after the college. ^ As of June 30, 2018. "Assets Under Management: Endowed Funds". Oberlin College. 2018. Archived from the original on 2019-02-15. Retrieved 2019-03-08. ^ a b NCES, "College Navigator". Accessed: 16 January 2019. ^ "Oberlin Conservatory of Music". www.kennedy-center.org. Retrieved 2017-06-18. ^ Faustine Childress Jones-Wilson; Charles A. Asbury; D. Kamili Anderson; Sylvia M. Jacobs, Margo Okazawa-Rey (1996). Encyclopedia of African-American Education. Greenwood Publishing Group. pp. 339–. ISBN 978-0-313-28931-6. ^ "Mission and History". Franklin and Marshall College. Retrieved 2019-02-23. ^ David Turley. The Culture of English Antislavery, 1780-1860. Books.google.com. p. 192. Retrieved 2017-05-23. ^ "Oberlin College Archives – Published Resources – Architectural Records Guide – Group 11". Greenreportcard.org. Archived from the original on 24 September 2015. Retrieved 28 June 2015. ^ a b "Oberlin College Archives – Published Resources – Women's History Guide – Group 11". Greenreportcard.org. Archived from the original on 24 September 2015. Retrieved 28 June 2015. ^ "Oberlin College Archives – Holdings – Finding Guides – RG # – Name (bdate-ddate) – Biography/Administrative Historywebsite=Greenreportcard.org". Archived from the original on 24 September 2015. Retrieved 28 June 2015. ^ "Constructing Black Education at Oberlin College". Ohioswallow.com. Retrieved 15 September 2014. ^ "Journal of Blacks in Higher Education". Jbhe.com. Retrieved 15 September 2014. 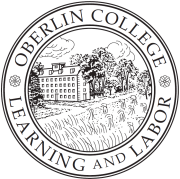 ^ "National Historic Landmarks Program – Oberlin College". Archived from the original on 17 October 2007. Retrieved 8 May 2007. ^ Timothy L. Hall (14 May 2014). American Religious Leaders. Infobase Publishing. pp. 226–. ISBN 978-1-4381-0806-3. ^ Henry Cowles; Asa Mahan (1849). The Oberlin Evangelist. R.E. Gillett. pp. 1–. ^ John R. Shook (1 January 2005). Dictionary of Modern American Philosophers. A&C Black. pp. 747–. ISBN 978-1-84371-037-0. ^ Brandt, Nat (1990). The town that started the Civil War. Syracuse University Press. ISBN 0-8156-0243-X. ^ "Oberlin-Wellington Rescue Monumentwebsite=Greenreportcard.org". Retrieved 15 September 2014. ^ "Harper's Ferry Memorialwebsite=Greenreportcard.org". Retrieved 15 September 2014. ^ J. Brent Morris (2 September 2014). Oberlin, Hotbed of Abolitionism: College, Community, and the Fight for Freedom and Equality in Antebellum America. University of North Carolina Press. pp. 122–. ISBN 978-1-4696-1828-9. ^ a b c "Presidents of Oberlin College". Oberlin College Archives. Oberlin College. Archived from the original on 21 October 2013. Retrieved 21 October 2013. ^ Robert K. and Olive Grabill Carr Papers, 1907–1981 Archived 2016-08-04 at the Wayback Machine, Oberlin College Archives. Accessed Dec. 17, 2013. ^ "College web sitewebsite=Greenreportcard.org". Retrieved 15 September 2014. ^ "Gender Policies". Greenreportcard.org. Retrieved 28 June 2015. ^ a b c d e "2/12 – S. Frederick Starr (1940– )," Archived 2015-05-07 at the Wayback Machine Oberlin College website. Accessed Nov. 5, 2015. ^ a b c d Foss, Sara and Miller, Hanna. "Pomp and circumstances: Nancy Dye's first four years," Oberlin Review (May 22, 1998). ^ "Presidents of Oberlin College" Archived 2013-10-21 at the Wayback Machine. Oberlin College Archives. Retrieved Dec. 17, 2013. ^ McIntyre, Mike, "Nancy Dye's Presidency," Oberlin Alumni Magazine vol. 97, #3 (Winter 2001). ^ Kaplan, Maxine and Hansen, Jamie. "Dye Announces Retirement: After 12 Years, Dye is Set to Step Down," Oberlin Review (Sept. 15, 2006). ^ Chen, David W. (2017-02-14). "Pace University Names Head of Oberlin Its Next President". The New York Times. ISSN 0362-4331. Retrieved 2017-05-30. ^ "Carmen Twillie Ambar Named 15th President of Oberlin". Oberlin News Center. 2017-05-30. Archived from the original on 2017-06-05. Retrieved 2017-05-30. 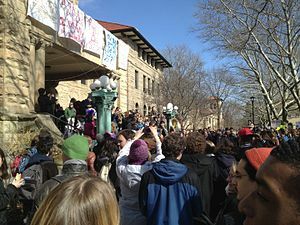 ^ "Oberlin: Students protest 'no trespass' list". WKYC. Archived from the original on 12 April 2013. Retrieved 28 June 2015. ^ "Secret 'No Trespass' list at Oberlin College raises concerns at forum". cleveland.com. Retrieved 28 June 2015. ^ Dobbins, Elizabeth. "The Oberlin Review : SFP Plants Flags in 'Call to Action'". oberlinreview.org. ^ a b "Oberlin Alumni and Students Against Anti-Semitism". sites.google.com. ^ Rogers, Katie (21 December 2015). "Oberlin Students Take Culture War to the Dining Hall". NYTimes.com. ^ "Oberlin Professor Claims Israel Was Behind 9/11, ISIS, Charlie Hebdo Attack". Thetower.org. ^ "Oberlin professors condemn colleague's controversial remarks, others defend them". Insidehighered.com. ^ Colleen Flaherty (August 4, 2016). "Suspended for Anti-Semitism". Inside Higher Ed. ^ "Jewish Oberlin professor's house vandalized, note says 'Gas Die Jew'". Jta.org. ^ "Oberlin College". U.S. News & World Report L.P. Retrieved 1 February 2018. ^ "Applying to Oberlin: Double-Degree Program". Oberlin College. Retrieved 15 January 2013. ^ "Academic Departments and Programs". Oberlin College. Archived from the original on 2014-10-21. Retrieved 16 October 2014. ^ "Sciences at Oberlin". Oberlin College. Archived from the original on 2014-02-21. Retrieved 23 February 2014. ^ "National Medal of Arts". Nea.org. Archived from the original on 23 September 2012. Retrieved 28 June 2015. ^ "Oberlin College Library". New.oberlin.edu. Retrieved 15 September 2014. ^ "Oberlin College Library". Oberlin.edu. 2012-05-23. Retrieved 2017-05-23. ^ "Fall 2002 Exco course listing". Oberlin.edu. Retrieved 15 September 2014. ^ "EXCO Committee". Oberlin.edu. Retrieved 15 September 2014. ^ Praeger (16 April 2010). American Universities and Colleges, 19th Edition [2 Volumes]: Nineteenth Edition. ABC-CLIO. pp. 1029–. ISBN 978-0-313-36608-6. ^ "Office of Winter Term". Oberlin.edu. Retrieved 15 September 2014. ^ "Collegiate Entrepreneurship – The Burton D. Morgan Foundation". Retrieved 15 September 2014. ^ "Oberlin College – Creativity and Leadership-About Us". Oberlin.edu. Archived from the original on 2014-09-21. Retrieved 15 September 2014. ^ "How to Start a College Entrepreneurship Club - Inc.com". Inc.com. Retrieved 15 September 2014. ^ "Oberlin College LaunchU – Collaborate, Innovate, Accelerate". Oberlin College LaunchU. Archived from the original on 2014-09-22. Retrieved 15 September 2014. ^ "The Oberlin Review : launchu". Retrieved 15 September 2014. ^ "About LaunchU – Oberlin College LaunchU". Oberlin College LaunchU. Archived from the original on 30 January 2014. Retrieved 15 September 2014. ^ "Chai Energy – LA Cleantech Incubator". Retrieved 15 September 2014. ^ "Members – Oberlin College LaunchU". Oberlin College LaunchU. Archived from the original on 7 August 2014. Retrieved 15 September 2014. ^ Engel, Matthew (2001-09-24). "Echoes of Vietnam stir US campuses". The Guardian. ISSN 0261-3077. Retrieved 2017-09-16. ^ "Colleges with a conscience". Retrieved 15 September 2014. ^ Merredith Collins and Melody R. Waller "Activism thrives through Oberlin's history" The Oberlin Review. 1 May 1995. Accessed May 6, 2015. ^ "Oberlin College: James Leo Walsh. 2015. Accessed 6 May 2015. ^ "Oberlin College students protest against fracking in Youngstown | Oberlin College". New.oberlin.edu. Retrieved 2017-05-23. ^ "College Lifts Ban on Coca-Cola Products". ^ Krislov, Marvin. "Building a Brilliant Future – The Source – Oberlin College". Oncampus.oberlin.edu. Retrieved 2017-05-23. ^ "Oberlin president finds hateful messages 'personally upsetting' | News". clevelandjewishnews.com. Retrieved 2017-05-23. ^ Voorhees, Josh (4 March 2013). "Oberlin College Cancels Classes Amid String of Racial Incidents". Slate. Retrieved 16 September 2017. ^ Kingkade, Tyler (26 August 2013). "Oberlin Student Says Racist Incidents Were Just A 'Joke': Police". Huffington Post. Retrieved 16 September 2017. ^ a b Bok, Oliver. "Temporary CDS Workers to Receive Free Meals" 12 December 2014. Oberlin Review. Accessed 25 May 2016. ^ Payerchin, Richard. 1 May 2015 "Oberlin Students take over building to protest tuition hike" "The Morning Journal News"
^ Harris, Melissa, "Students Meet with Frandsen After Protests" . 1 May 2015. The Oberlin Review. Accessed May 6, 2015. ^  "Oberlin College Strategic Plan 2016–2021"
^ "The 20 Most LGBT-Friendly Colleges". www.advocate.com. 2017-08-14. Retrieved 2017-09-16. ^ "The Best Gay-Friendly Schools". Newsweek. 2010-09-12. Retrieved 2017-09-16. ^ Katz, Joeli (2014-08-06). "Princeton Review lists 20 most LGBT friendly and unfriendly colleges of the year". GLAAD. Retrieved 2017-09-16. ^ "Oberlin College | Overview | Plexuss.com". plexuss.com. Retrieved 2018-03-07. ^ Standish, Duncan (5 April 2013). "KHC Out of OSCA". Oberlin Review. Retrieved 30 January 2017. ^ "How Oberlin Has Repeatedly Failed to Confront its Anti-Semitism Problem". Tabletmag.com. ^ "oberlin steel / history". www.oberlin.edu. Retrieved 2017-04-01. ^ "OCT_about". www.oberlin.edu. Retrieved 2017-04-01. ^ "Carbon Neutrality". New.oberlin.edu. Archived from the original on 21 June 2015. Retrieved 28 June 2015. ^ "Taking Sustainability to the EDGE". The Oberlin Review. Retrieved 29 January 2017. ^ "Oberlin College Green EDGE Fund". Ocsits.oberlin.edu. Retrieved 29 January 2017. ^ "College Sustainability Report Card 2008". Sustainable Endowments Institute. Retrieved 15 September 2014. ^ "College Sustainability Report Card 2009". Greenreportcard.org. Retrieved 15 September 2014. ^ "Green Campuses 3.0". MNN – Mother Nature Network. Retrieved 15 September 2014. ^ "Oberlin College – Green Report Card 2011website=Greenreportcard.org". Retrieved 28 June 2015. ^ "Oberlin College – Scorecard – Institutions – AASHE STARS". Stars.aashe.org. Retrieved 28 June 2015. ^ a b c Rebecca Cable, Renovated Dorms May Use More Energy, The Oberlin Review, April 2010, p. 1. ^ Rebecca Cable, Renovated Dorms May Use More Energy, The Oberlin Review, April 2010, p. 4. ^ a b Rebecca Cable, Renovated Dorms May Use More Energy, The Oberlin Review, April 2010, p. 4. ^ "Wilder Voice". Wildervoice.org. Archived from the original on 2014-10-11. Retrieved 15 September 2014. ^ "Plum Creek Review". Oberlin.edu. Retrieved 15 September 2014. ^ "Headwaters Magazine". Archived from the original on 2013-03-08. ^ "List of Oberlin College Student Groups". New.oberlin.edu. Retrieved 15 September 2014. ^ "Oberlin.edu". Oberlin.edu. Retrieved 15 September 2014. ^ "Oberlin College Athletics – Oberlin is Going Nuts Over Its New Athletics Mascot". Oberlin College. Retrieved 15 September 2014. ^ Karlgaard, Joe; et al. (2007-10-05). "Club Sports Demand Equal Attention". The Oberlin Review. Retrieved 2008-08-09. ^ "Oberlin College Athletics – Baseball Wins NCAC Title for the First Time in School History". Oberlin College. Retrieved 28 June 2015. ^ Perry, Nick. "Oberlin Cheerleading Club Revived". Fearless and Loathing. Archived from the original on 2 October 2011. Retrieved 10 October 2011. ^ "The Preying Manti". Oberlin.edu. Retrieved 15 September 2014. ^ "Through The Years In Glacier National Park: An Administrative History (Appendix A)". National Park Service. Retrieved 2013-06-15. ^ "Discovery and Exploration". National Park Service. Archived from the original on 2006-02-23. Retrieved 2007-01-12. Morris, J. Brent. Oberlin, Hotbed of Abolitionism: College, Community, and the Fight for Freedom and Equality in Antebellum America. Chapel Hill, NC: University of North Carolina Press, 2014. 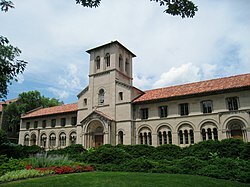 Wikimedia Commons has media related to Oberlin College. "Oberlin College" . Encyclopedia Americana. 1920.